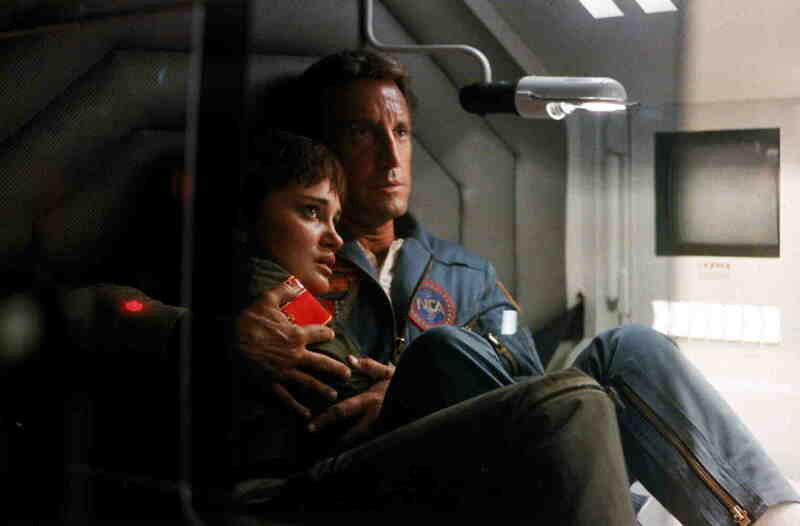 Director/Screenplay/Producer/Photography – Peter Hyams, Based on the Novel 2010 – Odyssey Two by Arthur C. Clarke, Music – David Shire, Visual Effects – Entertainment Effects Group (Supervisor – Richard Edlund), Stop Motion Animation – Randall Cook, Special Effects – Henry Millar, Wire Effects – Robert Harman, Makeup – Michael Westmore, Production Design – Albert Brenner. Production Company – MGM. Dr Heywood Floyd has been blamed for the failure of the Discovery mission and languishes in disgrace. He is then secretly approached by the Russians who invite him to take part in a planned mission to Jupiter aboard the ship Leonov to investigate the Discovery’s fate. Floyd joins the expedition, along with engineer Walter Curnow and HAL’s creator Dr Chandra. Once in Jupiter orbit, they discover that HAL was driven paranoid by conflicting orders to keep the mission’s purpose a secret. David Bowman then appears to Floyd as the amorphous Starchild, urging them to leave orbit immediately as the agency behind the monoliths is about to transform Jupiter into a sun. 2001: A Space Odyssey (1968) is possibly the greatest of all science-fiction films. Certainly, the grandeur of its reach – the whole of human evolution, the journey up into the next level of consciousness – and its visual audacity have been unparalleled. In the 1980s, when science-fiction publishing finally became a mainstream success, 2001‘s original co-author Arthur C. Clarke became one of several science-fiction grandmasters, including also Isaac Asimov, Robert Heinlein, Larry Niven and Harry Harrison – who sequelized, sharecropped and turned their previous successes into grandly unified multiverses. Arthur C. Clarke published three 2001 sequels – 2010: Odyssey Two (1982), 2061: Odyssey Three (1988) and 3001: The Final Odyssey (1997), although these became increasingly more mediocre as the original idea was diluted. Arthur C. Clarke’s novel 2010: Odyssey Two (1982) proved to be a best-seller. In the heat of the big post-Star Wars (1977) science-fiction boom, the film rights became subject to a bidding war. Attempts were made to inveigle Stanley Kubrick back but the director eventually settled upon was Peter Hyams. Hyams had achieved some distinction with his two previous science-fiction films – Capricorn One (1978), a witty satire of the space mission by way of Watergate, and Outland (1981), an effective translation of High Noon (1952) into space. Some science-fiction critics (Harlan Ellison, John Brosnan) unjustly ridiculed Peter Hyams for minor scientific errors but on the whole these three films form a trilogy of intelligent science-fiction works, making Hyams for a time seem one of the genre’s most promising directors. Hyams left the genre alone for a decade, while his later entries (see below) slip into merely hired-gun formula film-making. Out of all of Peter Hyams’s films, 2010 remains his finest work. 2001 did not need a sequel but 2010 fits the bill surprisingly well. Arthur C. Clarke’s 2010 novel was forgettable and this is one of the few examples of a story making a better film than it does a book. Certainly, on one level, 2010 lacks the epically transcendental reach of 2001 – where 2001 covered the whole of human evolution, 2010 is merely an investigative mission to discover what happened to the previous expedition. 2010 does climax with a transcendentally grandiose vision of the transformation of Jupiter into a new sun, which comes near achieving some of the original’s epic scope. Much more attention is paid to realistic science than probably any other film of the post-Star Wars boom, but there are certain other aspects such as a creeping case of the Spielbergain warm fuzzies. Peter Hyams has also added a whole subtext of East-West tension that was not in Arthur C. Clarke’s novel and the film’s one failing is in going out undercutting the grandiose beauty of Jupiter’s transformation with banal homilies about international cooperation and universal brotherhood. Where 2010 does work is in exactly the places that 2001 is lacking. Essentially it is a warmer, much more accessible film. Where 2001 was slow and filled with a minimalism of movement, 2010 is dramatic and exciting. Where 2001 felt like it was several different stories that only overlapped on a grander thematic level but not dramatically and where what was going on was never clearly spelt out but left for viewers to make up their own minds, 2010 comes with a clear and linear plot. Where 2001‘s characters were blank and deliberately bled of life, Peter Hyams invests his characters with vitality and emotional depth. In particular, Roy Scheider gives another of his warm, effortlessly likable Everyman performances and brings enormous heart to the centre of the film. 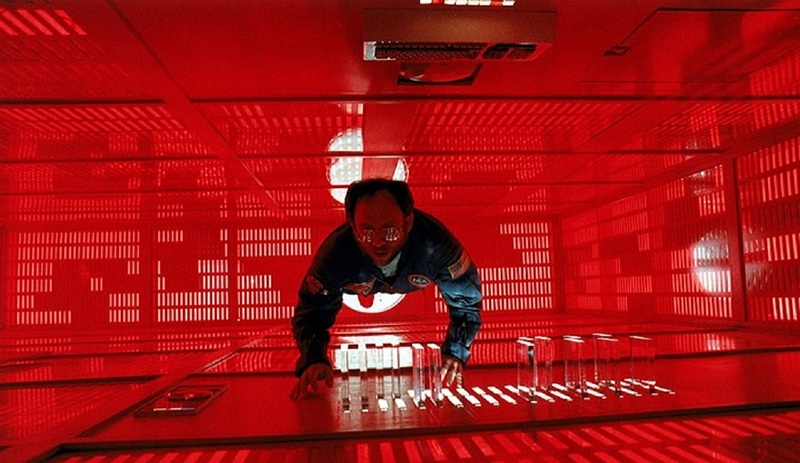 Standout also is Bob Balaban’s clever and dangerous voicing of the absent-minded professor role – HAL 9000’s end scenes hold something tragically affecting. The best aspect of 2010 is actually the effects, which at the time would be counted among the two or three of the very best displays of special effects in a science-fiction film. I was lucky enough to see 2010 in its original release in widescreen – the small screen, even letterbox format, robs the film of much of the impact and awe it has. The slingshot around Jupiter, the docking sequence with the twirling Discovery and the climax are genuinely stunning sequences. The film is a small masterpiece in its own right. A frequent misnomer about the film is that its title is 2010: The Year We Make Contact, due to the subordinate clause being used on the poster. However, 2010 is the only title in use on the film’s opening credits (which is regarded as the film’s definitive title by this site).. The only other Arthur C. Clarke adaptations to have made it to the screen has been the passable tv movie Trapped in Space (1994) and the heavily disappointing tv mini-series adaptation of Childhood’s End (2015).